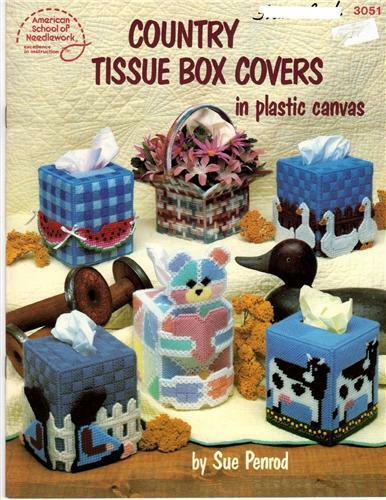 American School of Needlework Country Tissue Box Covers in Plastic Canvas plastic canvas pattern booklet. Sue Penrod. Uses 7 mesh canvas. Patchwork Teddy Bear, Happy Cat, Scotch Stitch Tissue Box Cover, Amish Dolls and Fence, Geese and Brown Fence, Tulip Ring, Watermelon Ring, Basket of Flowers, Loving Geese, Woolly Sheep, Quilters Flowers, Country Cow. 17 pages. Appears in new condition. Price tag and name handwritten on cover.